In 1765, Andrew Jackson, Sr., the father of the future president, moved with his wife, Elizabeth (known as Betty), and their two young sons, Hugh and Robert, to the Waxhaw settlement. They were Scots-Irish, originally from County Antrim in Ireland. It is believed that Andrew Jackson, Sr., bought farmland and built a home at Twelve Mile Creek, near present-day Mineral Springs, NC (just off Hwy. 75, east a few miles from the museum.) This farmstead no longer exists, but archaeological evidence suggests a home of modest means. Andrew Jackson, Sr., died in late February 1767. Betty traveled south to the Old Waxhaw Presbyterian Church to bury her husband. On the return trip, she gave birth to Andrew Jackson, the future president of the United States. Although stories abound as to the events surrounding the birth, as of yet no definitive evidence has arisen to authenticate the exact location of Andrew Jackson’s birth on March 15, 1767. Betty Jackson sold the home in North Carolina and moved in with the family of her sister at the Crawford Plantation just across the border in South Carolina. Young Andrew remained here until after the death of his mother and brothers during the American Revolution. During the war, Andrew served as a messenger and was captured by the British. Following the war, he taught school briefly in the area, then moved to Salisbury, NC, to study law. 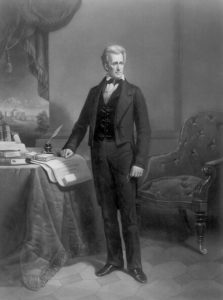 At the age of 21, Andrew Jackson moved west to Tennessee and never returned to the Waxhaws region. The debate over Andrew Jackson’s exact birthplace is ongoing. 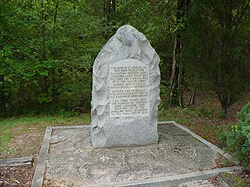 The two most likely locations are Crawford Plantation, located in Lancaster County, South Carolina, and the George McCamie cabin, located in what is now Union County, North Carolina. Both sites are located only a few miles from each other and at the time of Jackson’s birth the state line had yet to be drawn. Jackson himself claimed on many occasions to have been born in South Carolina, but it is important to remember that at the time he made these statements South Carolina was in a bitter dispute with the federal government. It is possible that Jackson may have been trying to show an affinity for South Carolina to ease difficulties with the state. A strong oral tradition claims that Jackson was born in North Carolina. Chief among this is the testimony of Mrs. Sarah Lathen, whose mother was a midwife at Jackson’s birth. She claims that the birth took place at the McCamie cabin in North Carolina. The Museum of the Waxhaws does not take any official stand on the issue, preferring to emphasize that the only thing we know for certain is that Jackson was born in the Waxhaws region, which encompasses parts of North and South Carolina.